Stewards Needed for Rebel Tour Parking!! 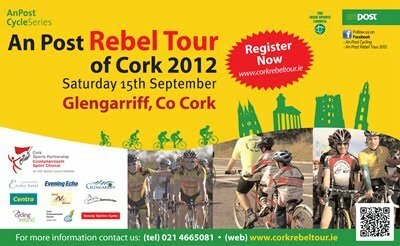 The Cork Sports Partnership is delighted to announce that this years An Post Rebel Tour is on Saturday September 15th 2012, in Glengarriff, Co Cork. Starting and finishing in the scenic village of Glengarriff the An Post Rebel Tour has a distance to cater for everyone. For more information on the Cycle click here! Glengarriff GAA Club is responsible for providing the Parking for this great event on Saturday Morning and we are looking for volunteers to act as Parking Stewards from approximately 7:30am until about 11am to facilitate the orderly parking of the large number of vehicles transporting the participants to the Village. High Vis Vests, etc. will be provided and everyone that helps out will receive a Goody Bag the same as the participants will receive, which contains the Rebel Tour Jersey! If you are over 18 and can help out in any way, even just for a few hours please contact; John Galvin, Club PRO on 087-7589585 before 9am Tonight (Tuesday, 11th September)! !